Riding a motorcycle on the roadways can be a very dangerous means of travel. 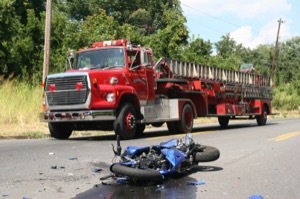 Very often, motorcycle accident victims are left with catastrophic injuries either because of their own negligence or the negligence of another driver. There is very little protection for a motorcyclist once he or she falls off a bike as a result of an accident. Very often, the driver is thrown violently into another vehicle, a tree, a barrier, the roadway, a ditch, a jersey barrier or the like. So many of these type of accident involve loss of limb or loss of life. We have all seen the crotch rocket motorcyclists who travel far in excess of the speed limit. They create a danger for themselves and others. They actually create a bias against the everyday motorcyclist who obeys the rules and regulations of the road. We have so many motorcycle enthusiasts who do care about their own safety and the safety of others on the road. It is a shame that there seems to be a stereotype that exists in the minds of many who think all motorcyclists are alike. There is a code of conduct that most good motorcyclists follow that is admirable. Most are courteous and follow all the rules of the road. Many motorcyclists treat each lane of traffic as if it is broken onto thirds. There is the outer third, middle third and inner third. If they are riding abreast of each other or in close proximity, they stay within their own third of the lane. Most understand that there can be blind spots for motorists so they attempt to be quite careful when approaching the blind spots. Most understand that drivers of automobiles may not possess good depth perception as it relates to motorcyclists so they maintain a safe distance between vehicles. Most understand the Drivers of automobiles are not paying as close attention to the roadway as they are traveling because of other annoyances within their vehicle s that one needs to be careful. In this day of excessive use of cell phones and texting in a motor vehicle, motorcyclists have to be particularly careful to avoid any such driver. A slight turn by a driver of an automobile may cause a sharp turn in response by a motorcyclist which could easily cause an accident for the motorcyclist. Obviously, drivers of motorcycles have much less protection that drivers or passengers of motor vehicles. They are not surrounded by metal on all sides with air bags to protect them. In virtually all accidents involving a motorcyclist, the driver is ejected from the bike and is then at the mercy of the environment for protection. A helmet, which is required by Maryland law, simply does not provide adequate protection. One only needs to see the catastrophic brain injuries caused by two football players colliding to understand the severity of brain injuries that could occur in a motorcycle accident. Unfortunately, many in the general public do not yield the right of way when required to motorcyclists. The end result is often very serious accident involving rear end collisions, left turn cases and lane change cases.